The space is still a bit funky, but functionally this is the studio of my dreams. Here are some pictures of the studio, and of the current project. There are three units: a 5 inch square with a 3 inch round center (you can see a few on the table), a 10 inch square composed of a 5 inch square with two 2.5 inch borders, and a 15 inch square (the 10 inch with another border). 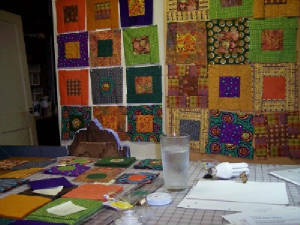 This is the first time I have worked from a pattern in a quilting magazine. (I usually do my own designs).